Some metal band names are just too good to be true. We’ve all heard the classic meme that if you threw a bunch of random violent words in a pool and had porpoises pick them out South Park style, you could come up with lots of metal band names. 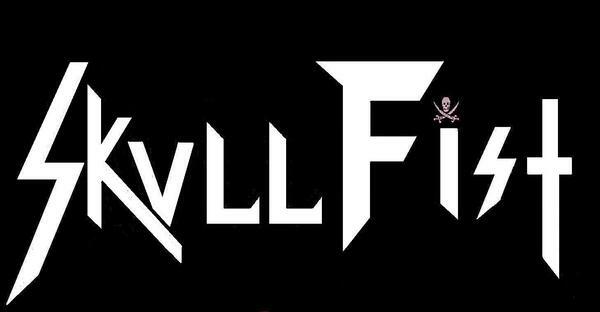 Skull Fist is one of the bands that seems to fit in that mold. Like, what is a Skull fist? A skull is a bone that has nothing to do with the fist. There are bones that make up the fist that are not the skull. Is this someone’s fist that is actually the extra skull of their twin who was undeveloped in the womb? My confusion notwithstanding, Skull Fist have a new album out this year, which, much like I imagine a skull fist to be, comes off as unnecessary and something I probably just don’t want anything to do with. Skull Fist is an energetic heavy metal band who utilizes lots of melody both in their guitars and vocals. Of note are the fantastically melodic and shreddy guitar solos, which are my favorite part of this album. I almost wonder if this album would be cooler as an instrumental that is just meant to feature the absurd guitar solos. That’s because the songs themselves are a little underwhelming and half-baked. The riffs just aren’t super memorable and the vocals, while displaying some impressive acrobatics at times, don’t tend to be very memorable either. Sometimes they’re even nonsensical like in the chorus of “Better Late Than Never,” which, for the life of me I can’t make sense of. 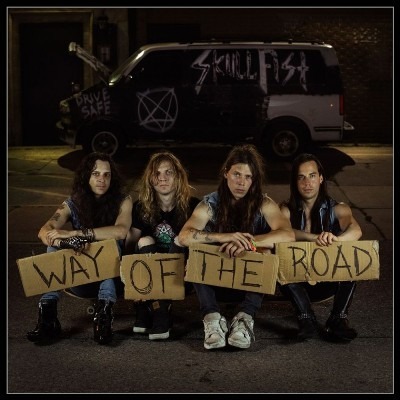 Skull Fist’s lyrical topics are typical tough guy 80’s metal tropes, like love, aggression, and being on the road. There’s nothing wrong with these lyrical themes! Judas Priest, among many others, have made great use of these themes. However, they need to be wrapped in strong songwriting, which just isn’t the case here. That’s not to say there aren’t cool moments on this album. These generally come in the form of insane instrumental breaks, like the interlude for “Don’t Cross Me,” or “Better Late Than Never,” both of which make me feel like I’m playing a Sonic the Hedgehog game. I often find myself enjoying these songs when the band is busy in the middle of a complex and flashy interlude, but once the song comes back to the verse, I tend to lose interest. There aren’t enough catchy melodies or riffs to carry these songs outside of the obvious talent it takes to play the more complex instrumental parts. Although most of the songs are at least passable, carried on the strength of the solos, the almost too ridiculous “Stay True,” is a cheesy power ballad with pretty much no redeeming qualities, utilizing a horribly cheesy 80’s sound that brings to mind the worst instincts of hair bands. It’s a song that could be featured on one of those hair band compilations they used to sell on tv. And if you somehow took that as a compliment, it’s not. A good contrast to this album is Hitten’s fantastic release from earlier this year. They use melody, typical 80’s lyrical themes, and over the top instrumentals, but they are packaged in the form of well-written and catchy songs. 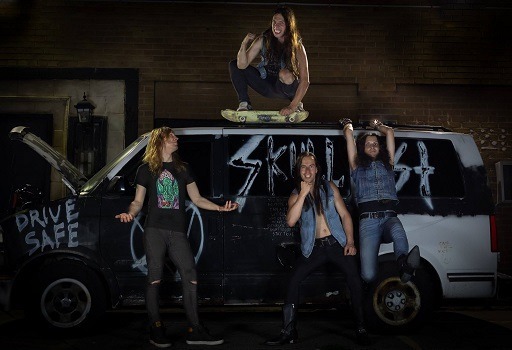 Skull Fist proves that all of the instrumental prowess in the world can’t make up for weak songwriting and a lack of memorable ideas. Unfortunately, I would direct you elsewhere (e.g., Hitten, Chevalier, Traveller, Susbtratum, Lucifer’s Hammer) for exciting and vital traditional metal this year, because you will not hear it here. Way of the Road is actually well-represented by its album cover. Four dudes sitting with cardboard signs in front of a van. Much like the album cover, the music has me begging the question: how much time and effort did you actually put into this, and is this the best you could come up with? This entry was posted in Heavy Metal, Reviews and tagged canada, Canadian heavy metal, Heavy Metal, Skull Fist, Way of the Road.